Ever since major industrialized nations learned how to fuse atoms in megabombs able to blast scores of square miles to smithereens, the quest has been on to harness the vast potential energy store that is nuclear fusion as a viable means to peacefully fuel modern civilization. Unlike fission, which involves the splitting of atomic nuclei, fusion both produces more energy while generating no radio-active waste. The primary fuel — H2 — is abundant and non-radioactive. Because conventional fusion reactors involve containment fields that force these non-radioactive elements together, they do not operate under dangerous conditions similar to nuclear fission reactors. The fusion reaction bi-products are also common, non-polluting elements together with a heat source used for mechanical work. Fusion reactors aren’t vulnerable to the same kinds of terrible melt-downs seen at Fukushima and Chernobyl. And the energy density of the fusion reaction itself is extraordinary, producing a potential for very high energy returns on energy invested. A world where an energy source of this quality is compact, economic, and widely available, is one within reach of a progression of advances and wonders. A human civilization with a growing capability to solve emerging problems involving a number of difficult limits. As such, viable fusion is seen as a kind of holy grail energy source. And ever since the 1950s, engineers have been pursuing technical and cost effective means to harness it. For part of the problem in harnessing fusion was the highly energetic nature of the energy source itself. To contain massive, hot, fusion reactions, magnetic plasma bottles were needed. Doughnut-shaped containment fields engineered to trap substances as hot as a sun. And the magnetic bottles themselves were energy-hungry beasts requiring major investment in infrastructure and materials. The reactor facilities necessary to produce such high-energy bottles were massive, involving megawatts of energy for the magnetic fields that would contain the super-hot fusion reaction and its resultant plasmas. 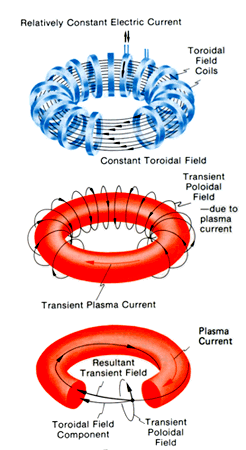 Such tokamak fields were very expensive to erect and maintain. In most cases, more energy was needed to keep the fusion reaction in check than could be gleaned from the reaction overall. But slow and steady advances continued — primarily aimed at building a large enough containment vessel to glean a useful return on the energy dumped into the tokamak fields. As the massive tokamak projects entered the 21st Century, a coalition of countries including the EU, the US, Russia and China, pooled efforts to construct the 23,000 ton ITER project. At a cost of $50 billion dollars US and growing, the project aims to provide a 10 to 1 energy return on energy invested by converting 50 megawatts of containment field energy into 500 megawatts of commercial energy. Such provision of a viable fusion energy store would, indeed, be a breakthrough and likely result in spin-off reactor technology if such offerings could be reproduced at relatively low-cost. ITER plans to begin testing in 2020 and hopes to be online and producing energy by 2027. It is worth noting, though, that the massive size and cost of projects like ITER serve to limit the likelihood that fusion energy will become commercially viable on any time horizon sooner than 20 years even if the energy production efforts are successful (although, one can well compare the 50 billion over decades cost of ITER with the $650 billion or greater annual cost of current ongoing oil and gas exploration). For much of the mainstream scientific community, the large fusion plasma containment field projects like ITER serve as the only hope for a viable fusion energy source. But ever since the late 1980s, an underground science has developed around what was, at first, called cold fusion. This fringe field emerged onto the world stage as an off-spring of work conducted and announced by Pons and Fleischmann in 1989. The two scientists provided reports observing a positive energy fusion reaction of deuterium occurring at low temperature in the presence of a relatively low-energy electrical current and a catalyst (palladium). It was also a continuation of previous work by Graham, Paneth, Peters, and Tandberg during the 19th and early 20th Centuries. Most notably, Tandberg stated in 1927 that he had fused hydrogen into helium in an electrolytic cell with palladium electrodes. Ironically, this work was mostly unknown to Pons and Fleischmann at the time of their announcement. Pons and Fleischmann’s paper rocked the scientific community — triggering an article about the researchers in Time Magazine and Congressional inquiries together with speculation that a dawn of a new energy era was at hand. Much of this speculation was fueled by the researchers, who provided extraordinary claims about the usefulness of the energy source they discovered. But the Pons and Fleischmann experiment was a sketchy subject for observational proofs. For like Tandberg, who had a patent based on his experiment rejected on the notion that ‘he could not explain the physical process,’ Pons and Fleischmann found resistance due to the fact that their observations would upend most of what was currently understood about atomic physics — chiefly that it should take a massive amount of energy to fuse atomic particles. Even more bedeviling, the experiment was difficult to reproduce. Sometimes, the positive heat energy reaction that Pons and Fleischmann reported was observed and sometimes it was not. This inconsistency continued to fuel doubt in the validity of this line of research. Even worse, there was very little in the way of sound scientific theory that could explain what was actually going on inside the reaction chamber to produce the observed heat. Conventional atomic science couldn’t produce a mechanism for such a reaction. And so the observations hinged on convincing the gate keepers of conventional science that a loop-hole existed in atomic fusion theory. A rather high bar to cross. Nonetheless, work continued on so-called cold fusion (now often labeled low energy nuclear reactions or LENR) at a number of government and commercial laboratories around the world. Japan, Italy, France, Israel, and the US all continued to conduct validation and observation experiments related to Pons and Fleischmann’s efforts. And a variety of commercial efforts also emerged — with some producing rather extraordinary but, as yet, still disputed claims. Last year, a team of scientists produced an observational study of a controversial generator called the E-Cat which claimed to use LENR technology to produce excess energy. The study validated the claim, but, as with most LENR work, has received broad criticism. A second potential paper, produced by the same authors, was listed on a blog earlier this month. The draft has yet to appear in any of the major scientific libraries. Until recently, commercial agencies working to develop fusion as a viable energy technology have split into two camps — the large corporations which have chiefly funded experimental efforts, and the small corporations like Rossi Energy which have been promising, but failing to deliver, viable LENR generators for the past few years. 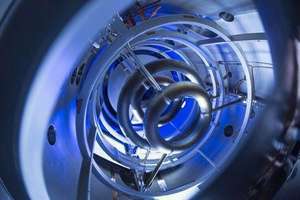 Now, as of last week, Lockheed Martin has entered the fray by making an announcement that it aims to produce a commercially viable small fusion reactor within the next ten years. Spear-headed by Skunk Works — the same group that produced the first stealth bomber and a number of other breakthrough technologies — the effort aims to have an experimental reactor off the ground within 5 years, military capable technology for ships, vehicles and aircraft within 10 years, and non-government/military reactors within less than 20 years. The Lockheed Martin reactors are planned to be compact — small enough to fit in an 18 wheeler truck bed. These compact designs would produce a relatively large amount of energy — about 100 MW. Such a design could power a moderate sized city, allow an aircraft to fly indefinitely, be used to power larger vehicles, and serve as an energy source for ocean-going vessels. Such a small design would be less costly, more useful, and more easy to rapidly test, develop, and deploy. The key to Lockheed Martin’s smaller design is the creative use of older containment technologies. According to reports from lead Lockheed Martin scientists, the Skunk Works team is using a technique that involves a cusp confinement method — which uses ring-shaped electromagnets to contain the fusion plasma. The electromagnets generate a field that bulges in the middle. 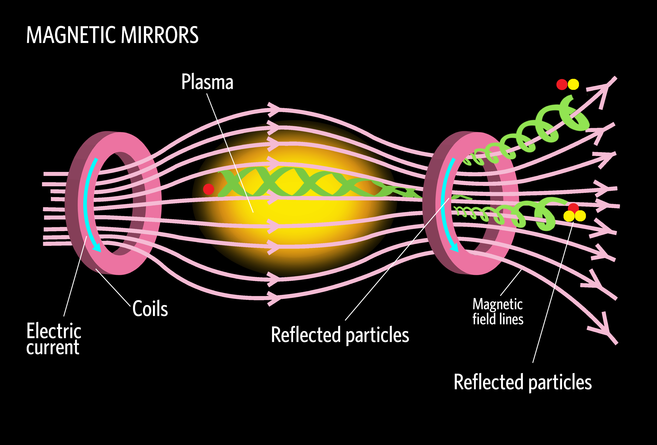 Magnetism pushes the fusion particles together. The further away from the fusion medium the particles stray, the greater the magnetic force pushing them back in. In the 1970s, cusp confinement was found to be too leaky to produce a fusion reaction. Martin’s solution is to surround the cusp field with a second magnetic mirroring field — also a somewhat leaky field. However, another innovation by Lockheed Martin is to shunt escaped particles back into containment using a third field layer. According to the, now anecdotal, reports from the initial research team, the experimental design features a viable fusion containment field using only 1 kilowatt of power. A claim that, if it bears out, could put this new design onto the cutting edge for fusion development, but would require quite a bit more testing to reach full power loads. McGuire said he and five to 10 researchers have been working for four years and have built their first experimental device. They carried out 200 test shots while commissioning it. He declined to say what temperature, density or confinement time they had achieved but he said the plasma appeared stable and they had heated it with up to one kilowatt of power. A Big Corp to Take on the Fossil Fuel Giants? As of yet, the Lockheed Martin announcement provides no scientific proofs (Lockheed says it has a scientific paper pending). And given the history of past fusion innovation claims, this prestigious company may well be taking a substantial risk in its early and apparently confident announcement. Some publications have already pointed out that LM is putting its reputation on the line. That said, perhaps the entry of the prestigious Lockheed Martin corporation into the fast track for attempting to provide viable fusion technologies is a sign that some of these energy sources — whether Tokamak or LENR based — are on the verge of a period of breakthrough. Even if the first high hurdle of commercial viability is crossed, whatever industries provide fusion systems will have to survive competition with the wealthy, influential, and politically powerful fossil fuel industry. One can expect a similar campaign of disinformation, undermining, delaying and detracting that has been waged against the world’s solar, wind and biofuel industries. Misinformation and fear mongering are most likely to arise as soon as any announcement of commercial viability goes widely public. This second hurdle may well prove to be even higher than the first and oil, coal, gas and, possibly, traditional nuclear special interest groups may well join to keep this option in its bottle. Before becoming overly optimistic, we must remember that both wind and solar energy showed great promise early on and have taken many decades fighting both real world limitations and entrenched special interests to gain the minor foothold they have now established. And these are both proven technologies that are in a vicious competition with the established smoke-stack interests. One would not expect much difference with fusion. If viable, it poses a greater threat than any current renewable energy system, so the opposition media campaign, in the event of publicly proven viability, would likely be shrill in the extreme. But fusion technology may have a few strikes in its favor. Though it may well be disruptive to traditional fuel suppliers, it may not be as disruptive as current alternatives to traditional utilities. Most of the applications that the new fusion producers are attempting to license would be plug and play… fusion generators could directly replace those in coal, gas, and nuclear plants. The new infrastructure, essentially, is limited to a reaction chamber or boiler. And should fusion prove viable, this ‘plug and play’ aspect of the technology may prove to be a crucial advantage. The compact nature of Lockheed’s prospective offering — 100 MW scale truck-sized reactors — should they emerge, could well be a critical fossil fuel replacement desperately needed in an age of ramping anthropogenic climate change. So let’s hope this is not a miss-fire on Lockheed’s part. Is Lockheed’s Fusion Project Breaking New Ground? Could Ultra-Cheap Energy be Just Around the Corner?